Why would I need self storage in Seattle, WA? There are a variety of reasons why you might need self-storage in Seattle, WA. How much is a storage unit in Seattle, WA? The cheapest storage unit in Seattle, WA is $32.00 per month. What size storage units do you have available in Seattle, WA? In Seattle, WA we have sizes that range from 2'x5' to 40'x15' to suit your storage needs. How much is it for a 2'x5' storage unit in Seattle, WA? The cheapest 2'x5' storage unit in Seattle, WA is $38.00 per month. Located in the Pacific Northwest, Seattle is a seaport city surrounded by Puget Sound, Lake Washington and the Cascade Range. This scenic locale boasts a variety of outdoor activities, top-notch cultural pursuits, five major professional sports teams and exciting entertainment options. Seattle may be best known for its iconic Space Needle, a structure that dates back to the 1962 World's Fair, but its history extends several more centuries into the past. The area was inhabited by Native Americans for over 4,000 years, and Europeans first settled there in 1851, naming the city after a local Native American chief. Seattle soon developed a booming lumber industry, but it really took off as a gateway point for those hoping to strike it rich in the Klondike Gold Rush. Once the railroad reached the city in the 1890s, a large and diverse population developed. Present-day Seattle is an epicenter of technology and aeronautics, attracting people and companies from all corners of the world. It also has a thriving tourism industry, with quirky landmarks like Pike Place Market, the Fremont Troll and the much-photographed Gum Wall. Seattle is home to numerous large employers and company headquarters. Boeing is one of the area's largest employers, and technology giants like Microsoft and Amazon also employ a massive workforce there. Seattle's biggest industries include trade and transportation, education and health services and professional and business services. If you're considering a move to Seattle, keep in mind that the city's fastest-growing fields include construction, trade and transportation and professional and business services. Seattle's overall cost of living is significantly higher than the U.S. average. Some essentials like transit, utilities and groceries are close to the national average, but housing costs are much higher here than elsewhere in the U.S. However, the proximity to excellent entertainment and dining, a range of professional opportunities and its friendly people make it worth every penny. Capitol Hill is a vibrant community of contrasts, considered the birthplace of '90s grunge music and also host to Millionaire's Row, where some of Seattle's wealthiest call home. If you're a coffee lover, this neighborhood has countless local coffeehouses where you can enjoy a cup. The downtown area may be compact, but it's packed with landmarks like Columbia Center, Pike Place Market and both Chinatown and Japantown. It's also home to the Seattle Art Museum, designed by famous American architect Robert Venturi. Pioneer Square is one of Seattle's earliest neighborhoods, dating back to its first settlers. Today, the tree-lined streets are filled with historic buildings where you can find some of the best dining, shopping and entertainment in the city. 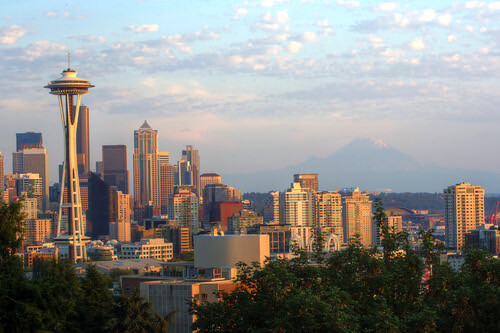 You'll know you've arrived in Beacon Hill when you see sweeping views of downtown Seattle, and even a snow-capped Mount Rainier on a clear day. The neighborhood has recently garnered attention for the Food Forest project, which utilized several city acres to create a lush urban farm. There are many educational options for you to choose from in Seattle, with Seattle Public Schools managing close to 100 public institutions in the city. Or, you have the option of enrolling your child in a Seattle private school, with both secular and faith-based institutions available. Electricity: Seattle City Light is responsible for all electrical services, and you can use their online system to easily set up your service and pay your bill. Water and Sewer: Seattle Public Utilities administers both water and sewer services, offering a Utilities Discount Program for qualifying residents. Recycling and Trash: The City of Seattle provides curbside trash collection. You can also receive free recycling services or drop off your recyclables at local disposal stations. Public Transit: Seattle has many options to make your commute easy, including bus, light rail and water taxi service. It's also known as a bike-friendly city, and special parking privileges are an incentive for carpooling. Seattle has 13 districts, each of which is home to several neighborhoods. Some, like Capitol Hill and Belltown, offer a mix of high-density residential and commercial zoning, while neighborhoods like Ballard feature more spacious urban environments. Most of Seattle's most desirable suburbs, like Redmond, Bellevue and Everett, lie on the city's northern and western edges. In Seattle, the percentage of renters versus homeowners is fairly equal, due in part to the high median home price. Our lowest priced units in Seattle, WA average $58.33 per month. 2300 people have reserved units in Seattle, WA in the past 30 days. There are 40 locations within Seattle, WA's city limits. There are 10 locations in Seattle, WA that offer AC and Heating features.